Sterilization in India: 11 women die in a state-sponsored attempt at family planning. 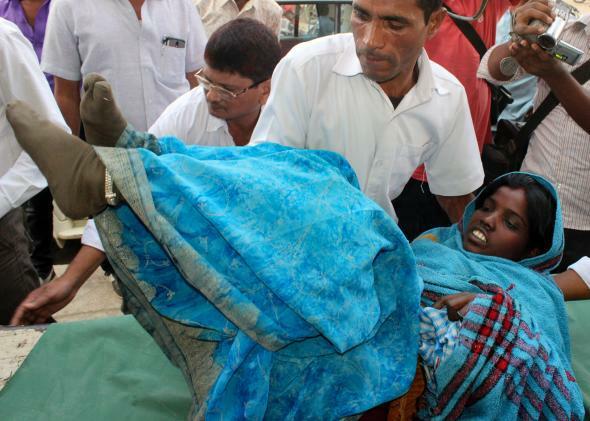 A woman sterilized during this week’s government drive is rushed to the hospital in India. India’s “sterilization drives”—state-sponsored initiatives in which the government pays women to get sterilized—are an attempt to control the country’s population, which is projected to become the world’s largest by 2028. As of Tuesday night in the Indian state of Chhattisgarh, one of India’s poorest, 11 women had died after one such drive. The women had been paid 600 rupees, or around $10. According to the New York Times, 83 women were operated on by a single surgeon over the course of six hours on Saturday, allowing for an average of less than five minutes per procedure. (It’s not safe to perform more than two to three sterilizations per hour because it takes 20 to 30 minutes just to sterilize and prepare the necessary surgical instruments, according to an expert interviewed by the Times). In the aftermath, 68 of those women were treated for septic shock, which Chhattisgarh health officials attribute to the surgeon’s failure to sterilize his instruments. These aren’t new problem in India, where over a third of married women rely on sterilization for family planning according to the last National Family Health Survey, conducted in 2006. Family planning in the country has a long and convoluted history, as detailed in reports by the Guttmacher Institute. In 1952, India became the first country to try to control population growth through an official family planning program, beginning with government advocacy of the rhythm method. The policy wasn’t very effective, and in the 1960s the government started introducing both male and female sterilization as options. By 1966, there were official sterilization quotas, and a year later the government started paying individuals to undergo the procedure, according to an article in the Political and Development Review. In the late ’70s, prime minister Indiri Gandhi’s son, Sanjay, launched a family planning program marked by widespread coercion and abuse. Only men with two children or more were supposed to be sterilized, but many who didn’t meet that criterion were nevertheless forced to undergo the procedure. During a two-year span, 8.3 million sterilizations took place, which led to a major anti-vasectomy backlash in the early 1980s. That backlash, combined with new techniques for female sterilization and the establishment of a number of programs focused on “women’s health,” shifted the population control efforts onto women. This sadly probably goes without saying, but: India’s sterilization initiatives are disproportionately pushed upon the relatively powerless rural poor. In 2012, 53 women were sterilized in a single two-hour period in the state of Bihar; the operations took place in a middle school without access to running water or sterilizing equipment. Bihar has the lowest per-capita income in India; as of the 2011 census, it also had the lowest literacy rate. In 2013, the state said it planned to open 13,000 sterilization camps—temporary field hospitals where procedures are performed en masse. And last year in West Bengal, the fifth poorest of India’s 29 states, more than 100 women were dumped unconscious in a field after a mass sterilization gone wrong at a hospital that could not accommodate their numbers. When questioned in parliament, health officials said that in the period from 2009 to 2012, the government paid compensation to families due to 568 sterilization-related deaths. While sterilization may seem an extreme family planning solution to those in the developed world, where birth control pills and condoms are the most widely used forms of contraception, it is the most popular method in the developing world, and the leading method of family planning worldwide, according to a 2011 UN report. Unfortunately, its abuse is also widespread. In Uzbekistan, for instance, tens of thousands of women, disproportionately poor minorities, are sterilized annually in order to meet quotas set for doctors. In some cases, doctors sterilize women while they are under anesthesia for unrelated surgeries. In Peru, over 300,000 women, mostly poor and illiterate Indians, were sterilized in an effort to control the birth rate in the 1990s. But lest you think this is only a problem “over there,” reproductive coercion has a long, dark history in the United States as well, where just last year, North Carolina became the first state to approve the payment of reparations to victims of forced sterilization in the 20th century. It was only this fall, too, that California banned forced sterilization in prisons after findings emerged that dozens of women had been sterilized without proper consent in California correctional facilities as recently as 2011.